Bay Leaf Enterprises, was founded in 1976 by Graham Day. It is a groundworks company based at Kirtling, just outside Newmarket. 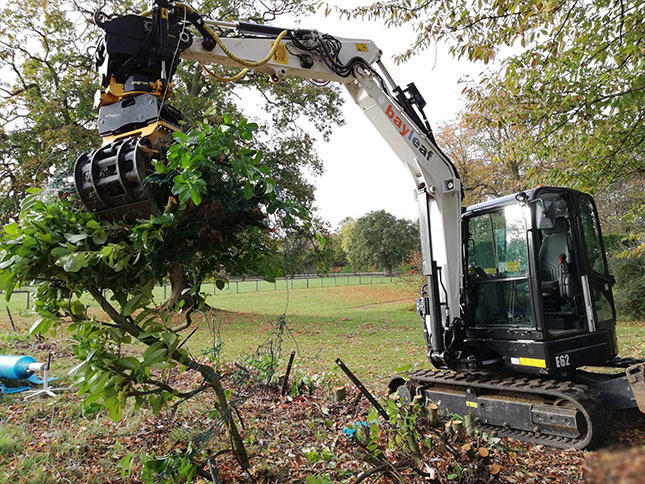 Graham’s son, owner and operator Darren Day has recently changed his backhoe loader and 3 tonne Terex mini-digger for a 6-tonne Bobcat fully equipped with an Engcon E206 Tiltrotator, Engcon Q-Safe hitch as well as EC-Oil, and he reckons it’s the best thing he ever did! Bay Leaf undertakes all kinds of groundworks for equine establishments, including paddock drainage/water services, lunge rings, menage construction, road/track construction, site clearance and landscaping. Newmarket is the birthplace and world centre ofthoroughbred horse racing, breeding and sales. It’s home to more than 50 horsetraining stables, two large racetracks, 3,500 racehorses and over 60 horsebreeding studs. It’s also a major export centre, with visitors from all overthe world. The Queen is a regular visitor, coming to see her horses intraining. 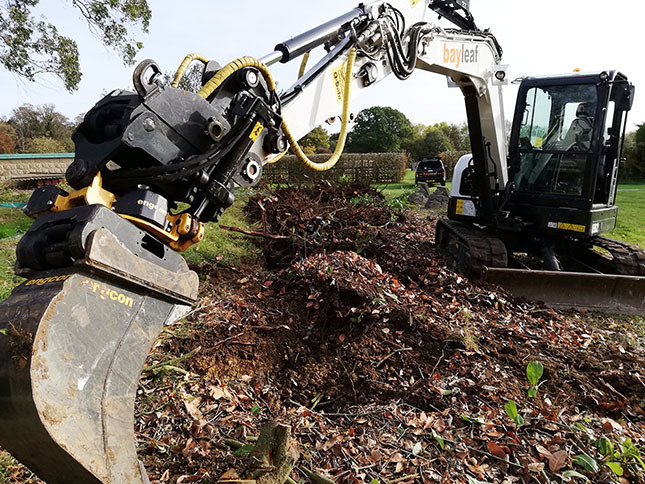 It’s a very smart place that needs some very sensitive landscaping!Which is why the Engcon tiltrotator has been such a great investment for BayLeaf. Darren comments: “Engcon has been a godsend. I’ve worked for several of the large estates around Newmarket, often in posh surroundings, with beautifully kept manicured gardens. The Engcon means I can work from one position without having to move the excavator to and fro, churning up the ground. My customers appreciate the difference – and it keeps disruption to the absolute minimum. “Engcon has been brilliant,” continues Darren. “Andrew and Robert are very supportive and easy to deal with. I’m 800 hours in with the new machine and it’s all going very well. The Engcon has transformed the way I work – and my customers are delighted. Some have asked me to work on projects on their estates elsewhere in the country – most recently in Gloucestershire. I’ve bought several attachments including a GRB0500 grading beam, complete bucket set, a SK05 sorting grab and pallet forks, which are really making life easier for me. Sadly my father died in 2012 and the business is now run by me and my mother. My father would have absolutely loved the Engcon. Check out my Facebook page for videos of me and the Engcon at work – facebook.com/bayleafents.